Having read and loved the stories of A Tapestry of Tears it was natural for me to want to read the new collection of 15 stories in this new book. Each story has its own uniqueness, stories of cultures that collide as the world gets smaller with the advancement of technology and cheaper travel. Younger generations that are finding a voice to change the lives they are expected to accept without question. Some of the stories are like looking through a mirror into a world that I know little about. A world far from mine. My life as a woman is very different to those in the stories. I felt humbled to share their lives in these stories. 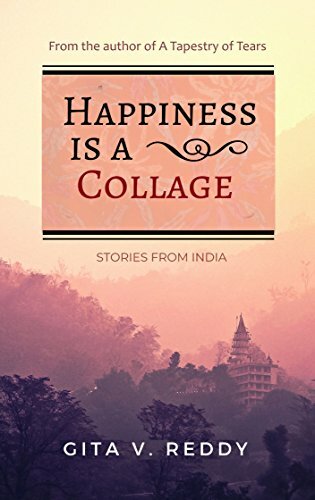 Gita Reddy is a wonderful writer that brings to life the feelings of her characters, the fears and courage that they draw on in so many different ways. Each story will affect you to different degrees. The one that still haunts me is the woman searching for her husband in the desert after he is thought to be dead. Her hunt to find him and the horror that follows. It still makes by heart quicken. The books bring India to me through Gita’s writing, it is mystical at times and at others secrets from behind closed doors shared in these chapters. One of the saddest things I get from these stories is often the cruelty of the mother-in-laws to their sons wives. A vicious circle that will repeat itself again when they in turn become the mother-in-law. These stories are the secrets of minds only to be shared with those that understand because their lives are the same. Woman to woman because they may be part of a big family but they always seem like they don’t belong, finding comfort in each other. So if you want something a little different this is a must read, come and share this world through this window. Highly recommended. Gita V.Reddy is a writer of fiction for middlegraders and adults. She enjoys thinking up tales of different genres. She has written mysteries, adventure, fantasy, science fiction, and even an animal tale for children.